We got over 13,000 ❤️ on the live chat! You guys are the best. Yeah, Ash guessed one detail in the next episode which I can’t post here because spoiler reasons. Sorry! Q2. What was your favorite part of episode 56? slcampbell18 A2 – when ines opened the door to brandon and brandon instantly knew something was wrong just by looking at her. I like how the reader recognized how amazing the friendship is between Ines and Brandon. Q3. Who is your favorite character? Tell us why. slcampbell18 A3 – while i love mason and ines. i like Daria. shes unique and interesting. Shes totally different. Q4. Should Ines forgive Mason? Why or why not? cams24 Q4: yes but not before mason works for it HARD. arrowhearts ines needs to listen to mason first. i know our girl is hurting but you once she’s able to clear the air with him it will all be good. mason needs to step it up!!! CYO31A4. yes she should forgive him but not get back together untill mason does something big big and apologizes to her in a way that she can see how sorry he is and how much he truly loves her and that he will never do anything to hurt her on purpose again. Q5: Should Brandon and Ines try dating each other? Why or why not? Okay, I’ll admit, this question is pretty wild. But come on — you know you were thinking it! 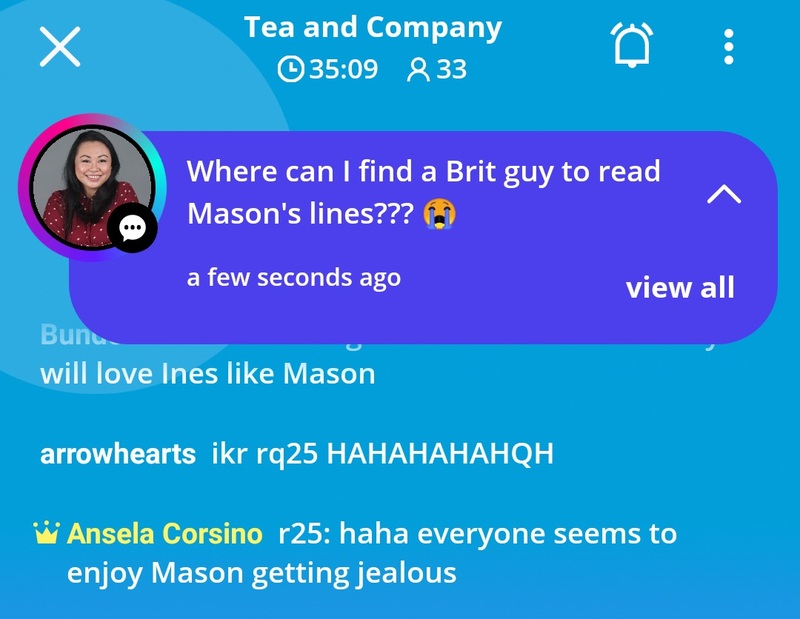 cams24 Q5 fake dating to make mason jelly? goldieontheloose Q5 : no. because they are absolutely awesome friends and I’m not sure they could have such awesome chemistry as ines and Mason. goteemtiger Q5 NO i dont ship Brandon and Ines. Brandon may be attractive and all but he’s not Mason. It would also be kind of weird bc she’s his assistant. Q6: should Mason try to get Ines back? Let’s not forget how much Ines loves coffee! Speaking of coffee, the next question had only one correct answer so it wasn’t hard to pick a winner. Q7. What are Ines’s two favorite beverages? Q8: Ines’s favorite beverages are coffee and tea. What are they metaphors for? First correct answer wins! Only one person got the correct answer, so they get 14 coins instead of 12. Congratulations to all the winners! You should have received your coins by now. If you haven’t, please drop me an email at ansela@anselacorsino.com and let me know. Of course, don’t forget to mention your Radish username in your email. If you haven’t won in last week’s Radish coin giveaway, you still have a chance! I’ll be doing another Live Chat on Sunday, September 23. It will start as soon as TBG Chapter 57 is published, which will be at 12 noon Manila Time (or 0400 GMT). The chat will run for three hours, and anyone who reads Chapter 57 during the chat can joinb. BUT if you join within the first fifteen minutes of the chat, then you automatically win three coins. Here are more details about the Live Chat. During the Live Chat, I will be posting questions and fielding answers. So you have until the end of the chat to put in your answers for a chance to win Radish coins! If you’ve already won coins in the trivia last Sunday, you won’t be able to win in the next chat. But you are still welcome to answer questions for fun. See you at the Live Chat!